The strange and self-willed girl Mignone lives in her own, remote and lonely world: a cupboard. This is her cage, full with memories and curious, miraculous personalities of her own fantasy. A performance about lost and found, the soul and music, happiness and loneliness. Mignone changes masks during her journey towards affection and herself. She realises that only through dedication she can get what she wishes. She creates a table, then she sets the table with tableware and food and she creates her own small family with the audience. 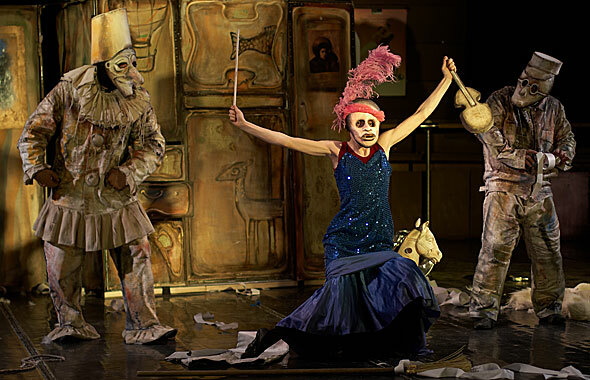 Mask theatre from Mr. Pejo's Wandering Dolls, founded in 1993 in Saint Petersburg, is inspired by authentic baroque dance, historic martial arts, medieval miniatures and more. The audience experiences an intriguing and interactive performance that makes you more than just spectator. This performance is made possible by het Wilhelmina E. Jansen Fonds.